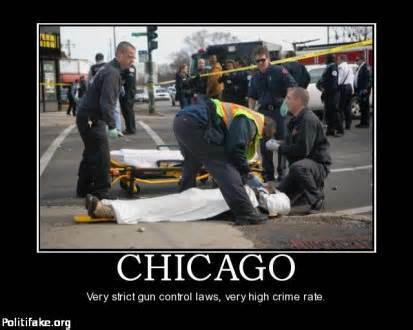 Chiraq: Now above 600 homicides for this year. From MyFoxChicago: Two men were killed and at least nine other people were wounded in shootings across Chicago during the Thanksgiving holiday. A fatal shooting happened early Thursday in the Chatham neighborhood on the South Side. A 38-year-old man was driving south through an alley with a female passenger at 1:35 a.m. in the 400 block of East 77th Street when they saw three males in the alley, according to Chicago Police. The man drove up to the trio and the two groups exchanged words before one of the males pulled out a gun and shot him in the head. He was pronounced dead at the scene, police said. The Cook County medical examiner’s office did not immediately release details about the death. The female was able to get out of the vehicle and run away unharmed after the shooting, police said. She was reportedly being uncooperative with investigators. The most recent nonfatal shooting happened about 4:20 a.m. on the Eisenhower Expressway between Ashland and Racine, according to Illinois State Police. A male victim was taken to Mount Sinai Hospital with injuries that were not thought to be life-threatening. Another man was shot several hours earlier in the West Englewood neighborhood on the South Side. The 31-year-old told investigators he was walking on the sidewalk about 1:05 a.m. in the 7100 block of South Hermitage when another male emerged from a gangway and opened fire, police said. The man was shot in the left leg and was taken to Mount Sinai, where his condition was stabilized. On Wednesday evening, a man was shot in the West Side Austin neighborhood. The 19-year-old was approached about 7 p.m. in the 500 block of North Lavergne by two people who started shooting before getting into a red van and driving away, police said. He was shot in the thigh and was taken to Stroger Hospital in good condition. About 45 minutes before that, another man was wounded in a shooting in the Belmont Gardens neighborhood on the Northwest Side. The 27-year-old was driving about 6:15 p.m. in the 4300 block of West Wrightwood when a red pickup pulled up alongside him and someone in the truck opened fire, police said. The man was shot in the leg and was taken to Illinois Masonic Medical Center, where his condition was stabilized. The holiday weekend’s first shooting happened less than an hour before that in the Southwest Side Lawndale neighborhood. About 5:30 p.m., a 30-year-old man was shot in the arm by a male who opened fire in the 1900 block of South Pulaski, police said. The man ran from the area, felt pain and realized he’d been hit. He was taken to Mount Sinai in good condition. A vehicle was also hit by the gunfire, but the 38-year-old woman driving it was not injured. Last year’s Thanksgiving weekend saw 68 people shot across the city, eight of them fatally.